But even in one of the worst economic climates Singapore has seen, there are those who manage to weather the storm and come out even more successful than before. We've covered the entrepreneurs and their brands who didn't manage to make it - but not everyone has it bad. These are the startups who have not just survived 2016, but pulled through #likeaboss. Ah, Shopback, the shopping platform that returns you cash whenever you shop via their platform. In January, the company announced that it was expanding its presence to include the enormous spending potential that was India, and they have. In local news, they were also named the Top free app in the shopping category in the iOS App Store, as well as number one in the top free apps category. People love to shop, but since they also love saving money, Shopback has definitely hit a goldmine. And even in Singapore, they are still growing. With their recent acquisition of Caarly, Carousell shows no signs of slowing down just yet. Singapore startup Fynd is a repair service that connects you with a technician for your broken tech devices, and at the convenience of your preferred location. After having announced a $385,000 funding just this year, Fynd has already become a popular go-to option for many, and successfully set up branch in Jakarta. Everything has just been going according to plan for the startup. Beauty-provider app Vanitee announced the acquisition of their competitor startup Mefitted this year. This move automatically opened up the B2B market for Vanitee, an area in which they lacked strong reach. With the acquisition, they gained Mefitted's 10,000 monthly active users. With the burgeoning success of Vanitee, the company is already looking at further expansion in early 2017. Valued at just over US$3 billion (S$4.34 billion), Grab is now Southeast Asia's second largest startup. A list of Grab's accolades this year include raising US$750 million in funding in September, building partnerships with self-driving vehicles nuTonomy, and the rolling out of the GrabChat app. As part of the newly-established Singapore's National Private Hire Vehicles Association (NPHVA), Grab drivers' interests will also be better protected. 18 months ago, Glints had 7,000 users. 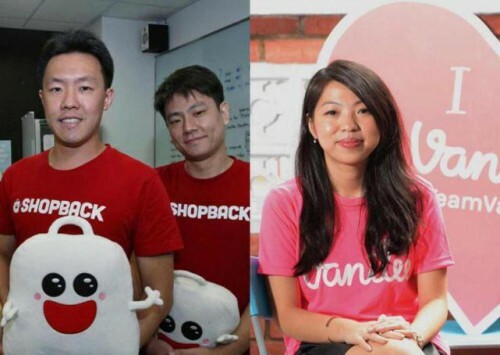 Now they have almost hit the 170,000 users mark, bagged US$2 million worth of Series A funding, and has more than 4,000 companies having built partnerships with them, including Grab, Carousell and Adidas. And that's not all they're doing. As of September, Glints has officially expanded into Indonesia, and raised US$2 million in a Series A funding round. Jack Ma is not a force to be trifled with, and is known for making smart business decisions, so considering that Alibaba has put in a stake of $1 billion into Singapore's e-commerce site Lazada is truly telling of the strength of the business. In November, Lazada also announced that it was acquiring online grocery site Redmart for between US$30 million to US$40 million. So AmazonFresh might be coming to Singapore, but it will definitely have strong competition on its hands. The year is almost coming to a close, and with the burgeoning strength of the startup industry with new players coming in all the time, it will be interesting to see how these startups continue to fare.